The Mandarin Oriental is easily becoming one of my favorite luxury hotel brands. They check all boxes when it comes to luxury, comfort and world-renowned service and their resorts are second-to-none. 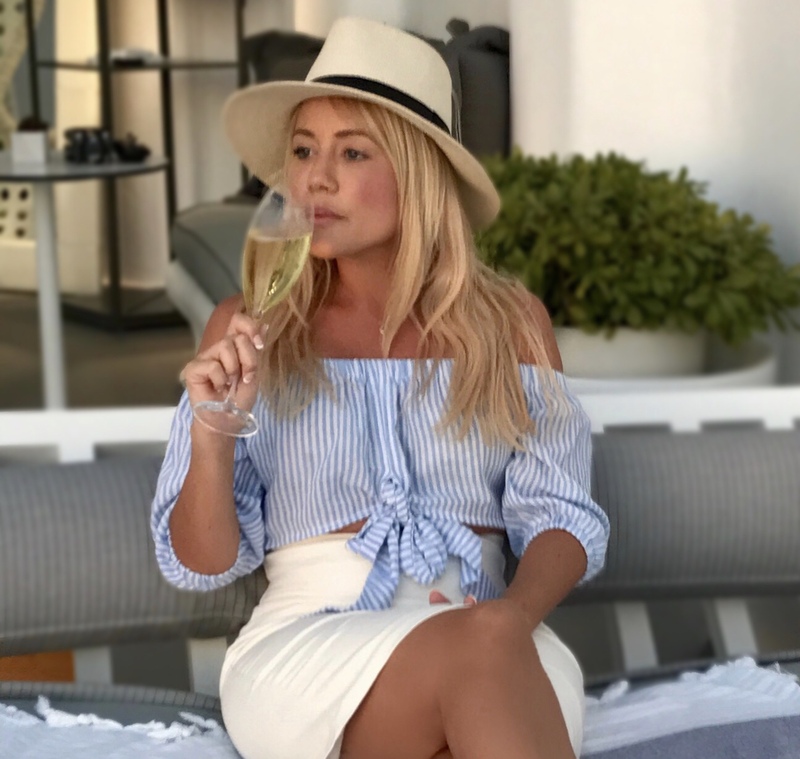 Having first stayed at their property in Las Vegas years ago, I have since been enamored by their opulence in every destination they have a presence. Earlier this summer, I visited their stunning property on Turkey’s Aegean coast in Bodrum. It was so wonderful, it left me eager for more. So when planning for accommodations in Marrakech shortly after, they were the easy first choice. 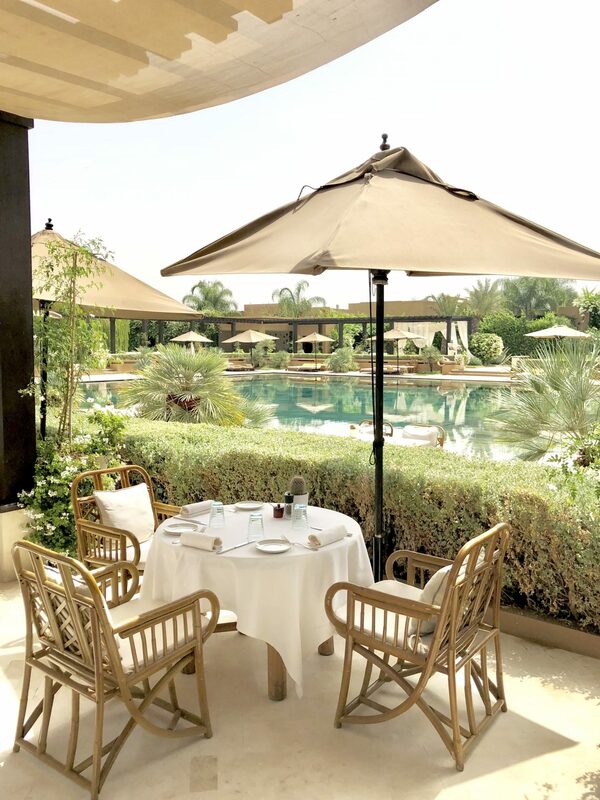 My experience at the Mandarin Oriental Marrakech was nothing short of my high expectations. The resort is simply beyond words. Upon arrival, my eyes began to pop over the extravagant Arabesque design as soon as we approached the main doors. It is an architectural dream with geometric symmetry at every angle. 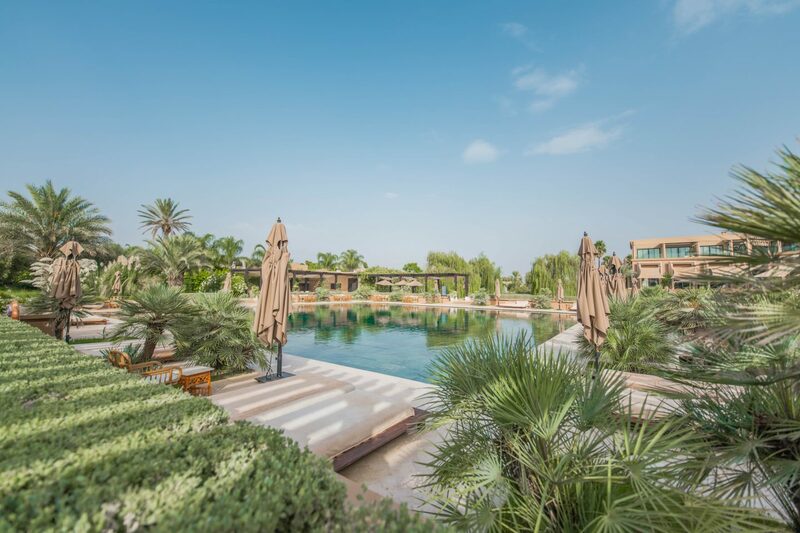 The resort is built on 20 hectares of wonderfully cultivated land. 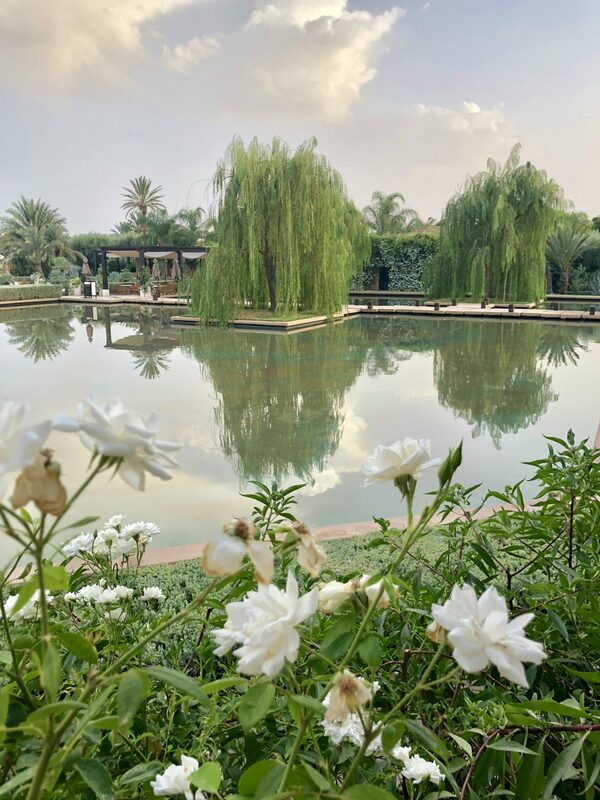 It is home to cacti, willow trees, olive groves, and over 100,000 beautiful roses. In addition to the plantations throughout, the property also features its own farm growing fresh fruits and vegetables for their dining guests. 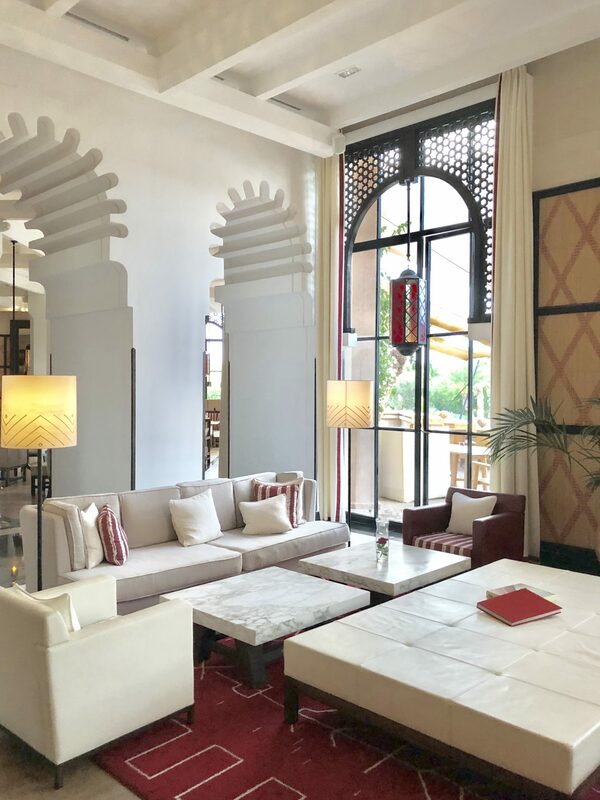 The interior is decorated with relaxed Berber decor throughout which nicely compliments the dramatic Arabesque structure and lush setting. The combination makes for a tranquil, yet luxurious feel. 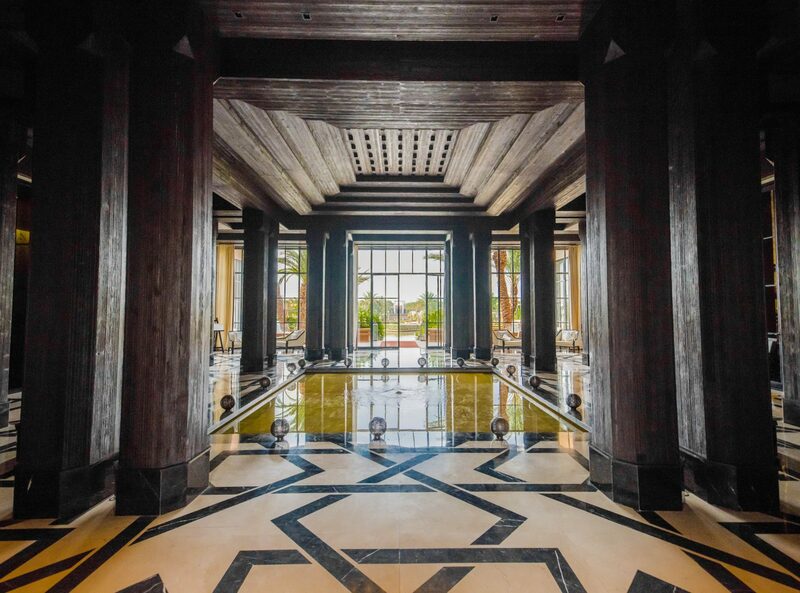 French architect, Pascal Desprez, designed the property in such a way that every angle is perfectly aligned. As you walk outside of the main building onto the resort, you can’t help but notice his work with the carefully appointed angles of their dazzling reflective pools. Everything diagonally lines up to face the opposite end of the resort. I couldn’t help but wish I could have brought my drone to see the marvel from above. We arrived fairly early to the resort, as we were just coming in from a night at Scarabeo Camp. While we waiting on our villas, we decided to hang out poolside catching some morning sun. 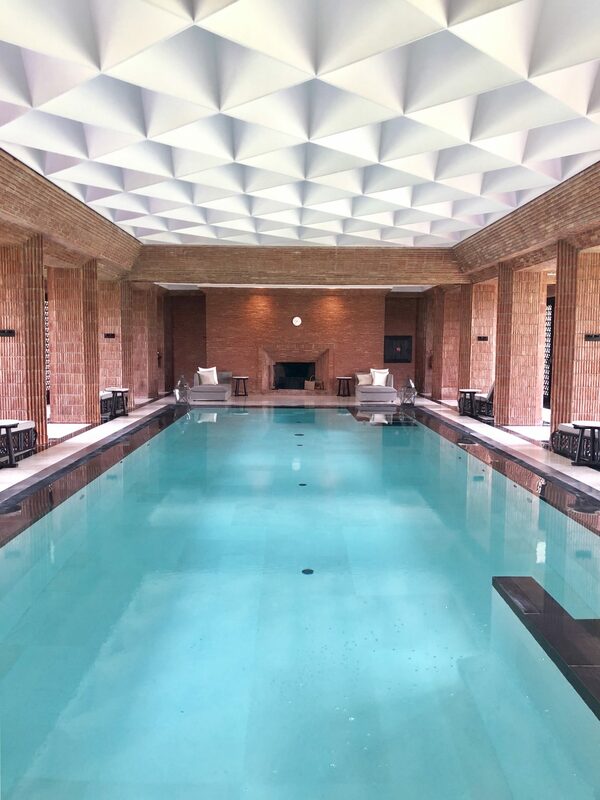 The pool is strikingly beautiful with emerald-colored marble complimenting the lush oasis. With all the greenery surrounding us, it truly did not feel like we were in Morocco! We enjoyed some delicious detox cocktails while we waited for our mini-palace to be ready for our arrival. 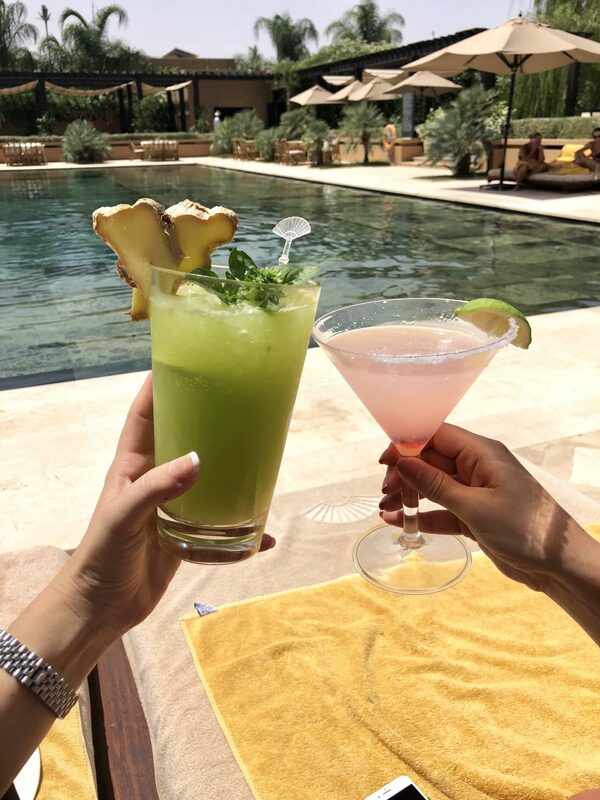 If you visit, you must try one – such a tasty curation of fresh fruits, vegetables, and herbs right from the resort garden. After a couple of hours at the pool, our villa was ready. The lovely staff came to pick us up from the pool to shuttle us over to our immaculate palace that we would call home. IT. WAS. AMAZING! Each villa is privately enclosed with concrete walls and fortress-style doors. Surrounding the perimeter were hundreds of roses in full bloom. 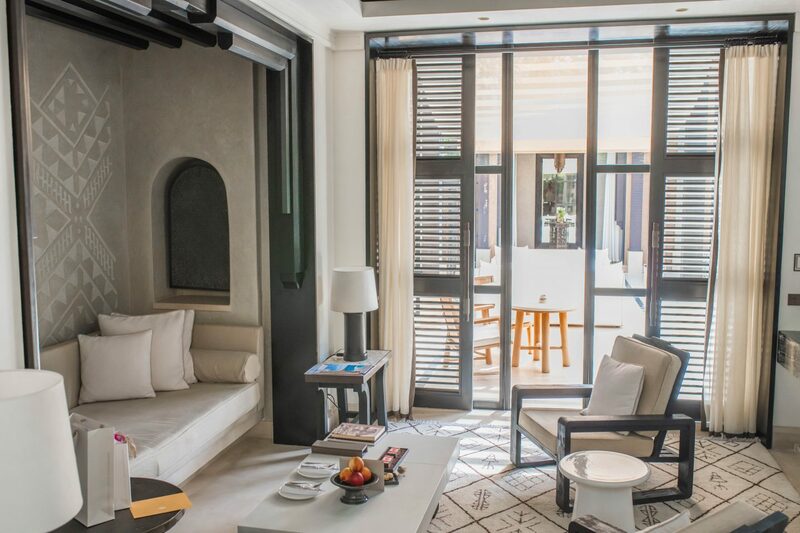 As we entered, we couldn’t help but feel as if we were walking into our own personal riad within a perfect Moroccan paradise. 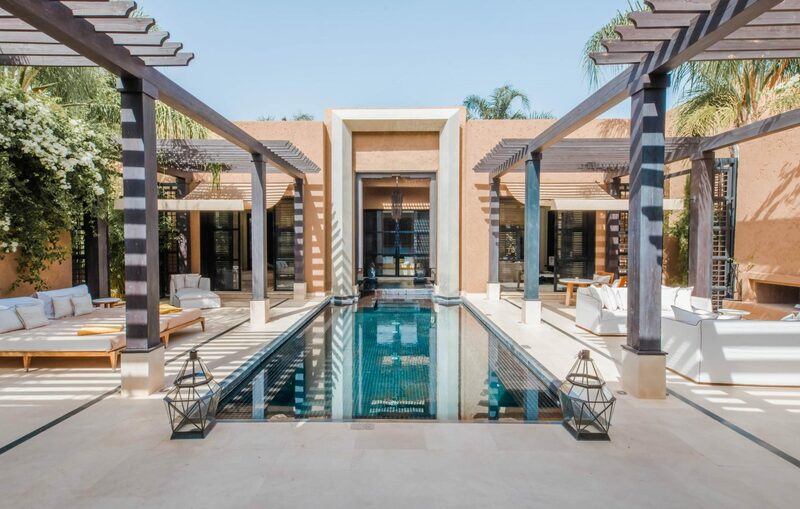 The abundantly spacious villa had the perfect mix of indoor and outdoor living space with a meticulously planned interior layout. As we entered into the courtyard, we were crazy over the size of the outdoor space and personal lap pool. 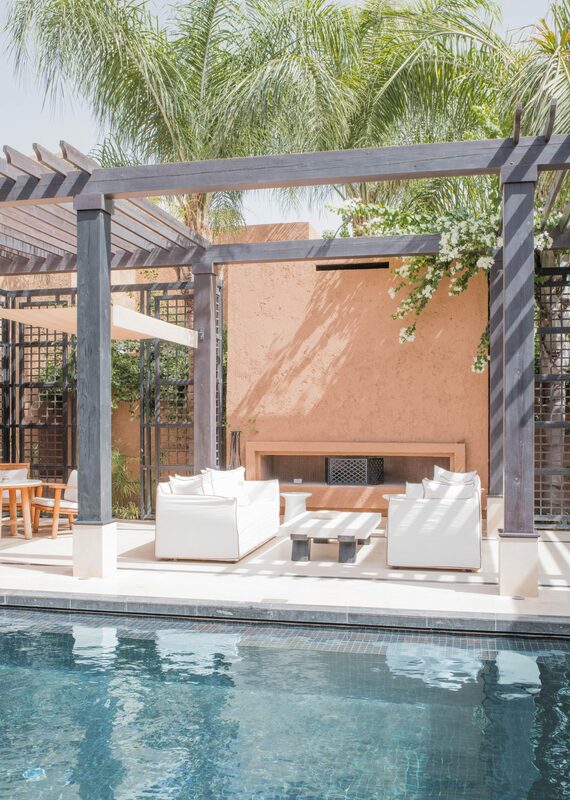 The courtyard was incredibly spacious featuring your own kitchenette, lounging space, outdoor hammam, fireplace, and dining area. The interior was just as impeccable. The layout is symmetrically divided with the master bedroom featured in the center. At the end of the bed, there are sliding doors opening directly into the jacuzzi. 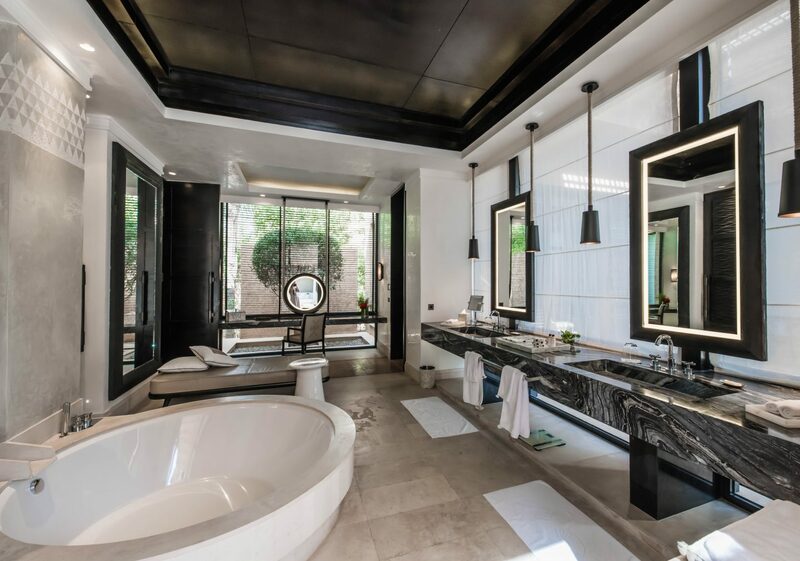 On one side of the bedroom is the spacious restroom with beautifully-appointed fixtures, generous vanity space, a soaker tub and separate steam shower (my favorite!). And on the opposite side, there is a large living space with sofas, TV, desk, and minibar. 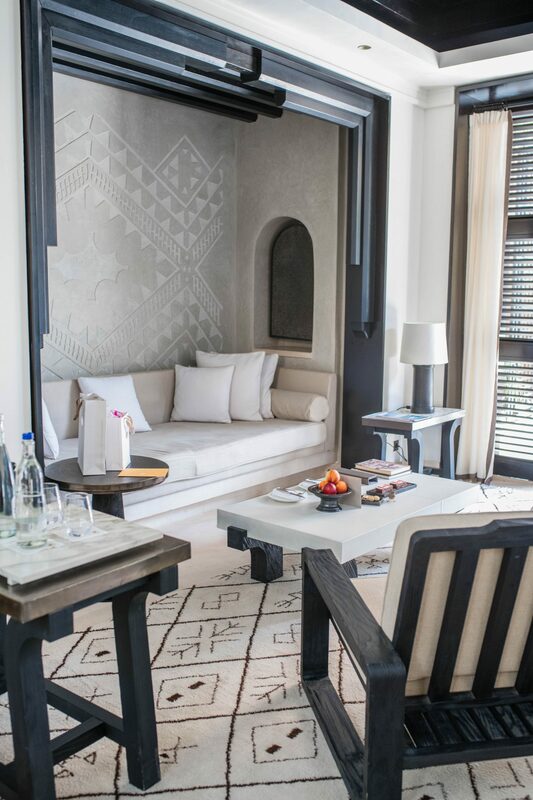 It was so perfect inside our private riad that we hardly wanted to venture into the resort! We ended up eating several meals in the comfort of our villa and truly enjoyed lounging around enjoying the life of luxury. I can certainly attest that the room service is fantastic as we dined from it several times. However, if you want to enjoy a meal outside of your villa, they have three excellent restaurants on site. Of the three, they have Mes’ Lalla, a Moroccan-fusion boasting a farm-to-table dining experience. For another dinner option, they have Ling Ling, an Asian-inspired fusion under the Hakkasan group of restaurants. And finally, the Garden Restaurant for casual dining by the pool. The Garden restaurant is perfect for lunch or to enjoy the previously mentioned detox cocktails. Breakfast is served in the Berber salon offering a wide selection of healthy and hearty options. While I, unfortunately, did not have the chance to enjoy a treatment at their world-class spa, I did mosey through to take a peak. The spa is beautifully appointment with traditional Islamic design. On either side of the hallway, you will walk through dramatic brick archways to access the treatment rooms. 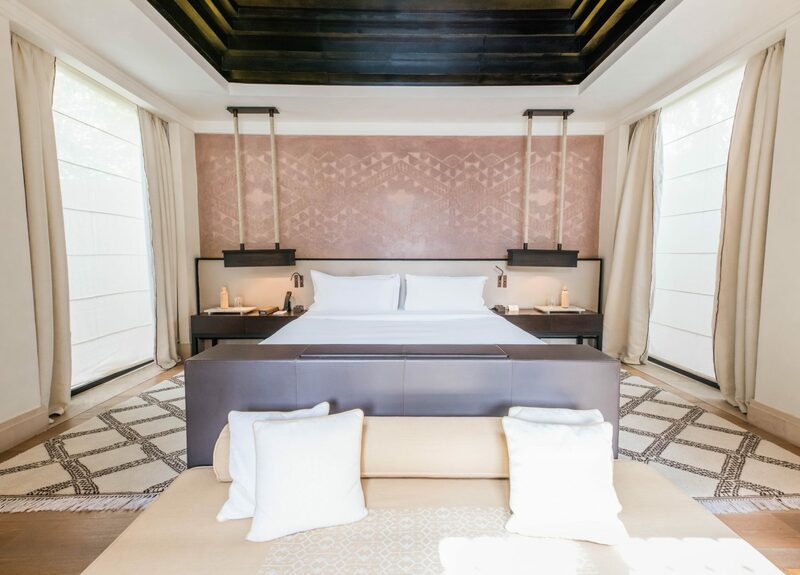 You will also find traditional hammam-style treatments rooms with access to steam rooms, saunas, showers, and baths. Continuing on to the other end of the corridor you enter the indoor pool connecting the spa and the fitness gym. Having only walked through on my final day, I truly felt regret for not booking a treatment. Only more reason to make it back here one day. THANK YOU, Mandarin Oriental for another wonderful stay! 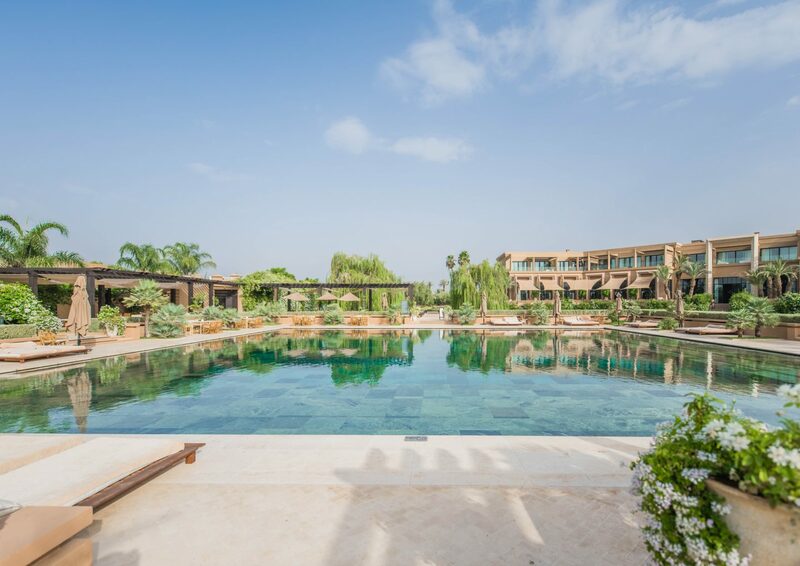 It was truly unforgettable and I hope to have the privilage of visiting this magnificent property again in Marrakech!